In the United States, fig trees were once relatively uncommon outside of the warm, southern states and sunny California. Over the last several decades heartier hybrids like the Croisic, Desert King, Genoa, Osborn's Prolific, and Verte have developed that can survive and even thrive in cooler, wetter climates like the Pacific Northwest. You can grow fig trees anywhere on the West Coast and in many other climates in the United States. Figs tend to be expensive produce, but if you are lucky enough to have a good fig tree, it can be an excellent source of cheap backpacking food. 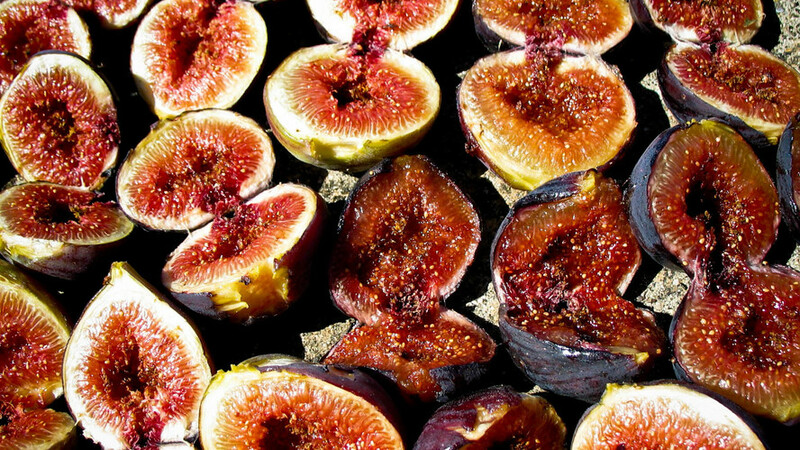 Vacuum-packed figs can be stored long term in the freezer for the next hiking season. Figs can be god-tier food, and when quality figs are dried, they make a wonderful backpacking snack. Some fig varieties dry better than others, and care should be taken to avoid dehydrating immature fruit, as the tissue may be too tough to adequately allow water to escape, making for long dehydration times and even causing the fruit to spoil before it is dried. Care should be taken to avoid dehydrating immature fruit, as the tissue may be too tough to adequately allow water to escape. Whole figs dehydrate better when their skins have been checked. Dip them in boiling water for 30 seconds followed by a plunge into ice water. This will weaken and damage the skins, allowing moisture to pass more freely. Fig slices will dehydrate faster, but slicing decreases the shelf life of dried figs. Sliced figs will benefit from an ascorbic acid or fruit juice pretreatment before drying, and should be stored in airtight containers in the refrigerator until you plan to eat them. Figs can also be pureed to make a fruit leather. If your figs are too tart for your palate, making a puree allows you to easily sweeten them to taste. Adding sugar also helps to preserve the fruit. Select only fully ripe figs for drying. Under-ripe figs will be too tough to adequately dry. Wash the figs in cool water. Use a rag or a vegetable scrubber to further clean chemical coatings from commercial figs. Figs can be dried whole and larger figs may optionally be chopped in half. Smaller slices will dry faster, but will not keep as well. Next we "check" the fruit (weaken the skins as follows): Bring a large pot of water to a boil, place the figs in a stainless steel basket, and dip them into the boiling water for 30 seconds. After removing the figs from the boiling water, immediately plunge them into another container of ice-cold water. This will weaken the tissue in the skin, allowing the fig to dehydrate faster. Place the checked figs into dehydrator trays, a single layer thick. Dehydrate for 6-12 hours in a counter-top food dehydrator set to 140° F, or 24-36 hours in a convection oven. Allow a sample fig to cool to room temperature before judging if it is finished. It should be leathery, chewy, and completely dry to the touch.